It is Guru aadesh (guru's order) not to share anything about sadhana nor even discuss amongst each other and thus nothing pertaining to it is being shared (the blog has otherwise also never shared any sadhana or kriyas, but just the teachings) Baba also added that anyone trying to attempt it without this deeksha, can bring in damage to themselves/family badly. So, to avoid karmic implications, he requested that the CD pertaining to it or sadhana in any form be kept strictly to sadhaks receiving the deeksha only. The divine air at BITs Pilani, Goa has been great for more than a week now. i had the opportunity of meeting so many wonderful souls and i am sure that Baba has surely built a strong army of divine beings on earth called Shivyog Sadhaks. The energies have been intense here due to Baba's presence and also Sree Vidya sadhaks all spread around emitting these high energies. It felt like having had a trip to one of the higher dimensions. Whenever i looked around, i had a picture of how the 4D world maybe going to look like. With sadhaks spread all over the world, it looks so sure that things are working at all ends as Babaji works through his sadhaks for the human ascension process. This shivir looked like a gathering of the sacred mission :) Whenever i interacted with sadhaks, this time a common experience seemed to come from everyone. It was about feeling certain energies even before coming for the shivir. Some felt it at home itself, some during journeys and some as they landed in Goa. Many of them spoke of experiences that brought them there through unexpected conditions. Many spoke of miracles that happened and getting their seats or money when it all seemed impossible. A sadhak whose registration was not fulfilled was looking curious at the entrance but she told me with firmness that she would sit in front of Baba, and she did so for entire shivir as she got a seat in there! Something happened with me too as my train ticket was booked for May 20th only to realize at midnight in the railway station that the date should have been booked as May 21st. As i was planning to leave back home and catch a bus next morning, a person in the station told me to buy a general ticket and meet the TC. Mysteriously i was guided to a person in F4 compartment who sat on his luggage at the entrance, who possibly seemed to have had no place too. I asked him and he said he also was waiting for the TC. The TC came in and after charging the necessary amount from me and him, took us both to one place and made us sit on a seat and asked that we wait. As the train moved with everyone around sleeping in darkness, this person asked me if i was going to Goa as it was his first time to Goa and he looked pretty disturbed. He shared that he had missed this same train earlier. He overpaid an auto to hurry him to the next station only to find that as he reached the station, the train was moving. He jumped into the moving train in spite of the TC in the train scolding him not to. He then innocently asked me if i knew where BITs Pilani was in Vasco and i smiled and said "namah shivaya" to him. He just jumped in joy of having found another sadhak and shared loudly his story amongst the sleeping passengers. i was willing to take it from the disturbed passengers than wanting to stop listening to his excited story. He said his name was Suresh and that he did not have a room registration and that he knew that Baba was helping him but didn't know why with all these troubles. i told him, these all seem like troubles, but he does what is best for us and told him that even my ticket was accidently booked for previous day and that now i had lost my reservation. i would have boarded another compartment if the ticket was right! The TC then came and gave us a berth each and i went off to sleep on my upper berth. Early next morning as i woke up, all people had woken up around and all i could hear there was words like "prati prasav", "shivir", "Babaji", etc. This person, Suresh , a very simple person from Sangli, Maharashtra became one of my best friends as he shared my room for the next 7 days :) After the shivir's last day, me and Suresh were thinking how to go out of the campus to move to Panjim as we exited the hostel and a taxi came up right in front with a sadhak whom i had met in this shivir who was going towards Panjim and he dropped us there only to find our respective buses waiting there to take us home. This sadhak happened to be one who took deeksha from Baba after reading this blog and we had exchanged mails before that. We both were happy to meet each other. In the taxi , he shared with me of how when he was in total bed rest with a slip disc, Baba gave him Sanjeevani regularly. He also heard Babaji chanting in crystal clear voice in his ears in the mornings the Shiv Panchakshara mantra and the Shambhavi beej mantra. His registration was rejected for this shivir but later he got a floor seat. He was worried of how would he sit on the floor after having just recently recovered from the slip disc, on reaching the hall he was pleasantly surprised of getting a seat which was of someone who could not attend the shivir and this seat was ahead of those who even booked earlier. He mentioned these things to Baba in the shivir also. On one another day as Ishan Bhaiya provoked Baba to sing and as the rhythm picked up, Baba sprang out of his chair enthusiastically singing "Jab koi baat bigad jaaye" and this time it was a rocking performance. It looks like Baba is fully geared for the "Rhythm of Universe". The most significant thing about the performance this time was Babaji's dance step. It is eye widening to see Baba dance to such glory! He added a few dance steps, especially a signature dance step that roared the crowd with claps and laughter. He just jumped and tossed in all around the stage - have never ever seen Baba in such energy! Baba has mentioned that he will be fully on the move now a year from now before going into his sadhana. Babaji has been seeming quite serious and firm about his sadhana decision and all his rigorous activities for the year shows clearly that Baba wants to initiate the maximum number of people. 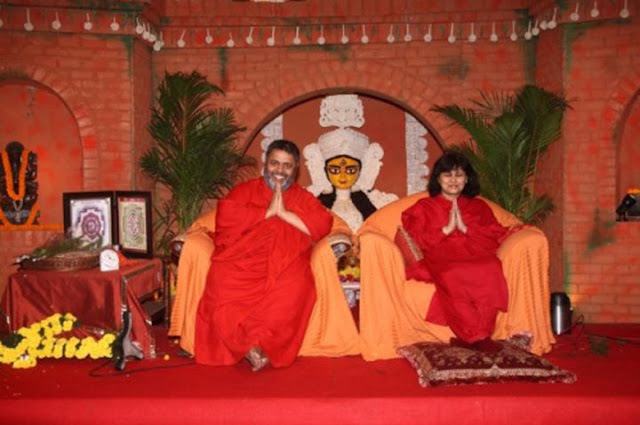 Our guru has been assuring at all times that he shall be at all times with his devotees and to learn to connect to him and "call". i must add that experiences of Baba's presence with sadhaks in their lives during moments when a sadhak calls, has been evidently getting stronger and stronger as per the sharings from so many sadhaks i am interacting with. i must very, very strongly add that Baba has been with all and will be with all, whether this may be known or not acknowledged due to whatever our limitations are, but Baba is fully out for his sadhaks and doing everything to increase his presence with sadhaks at all times and it looks it is only increasing, irrespective of whatever decision Baba takes - for it would be for the benefit of us and humanity. He knows it all and knows what is right and thus we must support his mission with the greatest guru seva that Baba says is by bringing his teachings into practical life and adhering to it in completeness without any contamination. Sadhana, seva, sankirtan as Baba says will work miracles for sadhaks. Babaji said he would be giving higher deekshas soon. All the things look pretty quick and happening at lightening speed, it is sure that Baba knows it best how things should be done during this crucial period of ascension. Baba has asked to spread it all as much as possible if it can help someone, except to refrain from sharing any sadhana, not just higher levels but all other levels of sadhana too. Many spoke of so many instances where Babaji's love and protection was felt and experienced even during dangerous experiences in life. It was quite evident that Babaji is making himself very much available to all sadhaks, which he always says, "I will come but it is you who has to call." Babaji would surely enhance this presence even more with his future sadhanas he wishes to undertake in the near future. i personally had experiences during the travel where mysterious things have happened. So, overall, this time so many sadhaks conveying his presence is some way or the other a clear indication of our guru's promise. So much of power, a God-being walking on earth as a guru, yet when in the shivir, one can easily overlook his godliness with his calm, shattering humility, child-like innocence and playfulness, detached serenity, and his unmatched patience with mistakes and ignorance of anything and everything around. He does anything and everything for his sadhaks and pretends as though he knows nothing about it! Babaji in almost all the days of shivir hinted about his mission. As the earlier message (click to read) Babaji wishes to go into seclusion for his own higher missions and for all his sadhaks and humanity. Babaji had mentioned in Chennai shivir that he will do two to three shivirs a year to fund the ashram and other 5-day shivirs will be free to the world. One thing that is misunderstood is the word 'samadhi'. Being in samadhi and taking samadhi are entirely two different things :) Babaji mentioned many times about these things indirectly as siddhas never speak anything directly but it is up to us how we decipher every message from the guru, and that should never be hasty or sudden reflexes. They should be contemplated upon for the depth of their words. Babaji also mentioned that he has empowered Ishan bhaiya with the shakti and that Ishan bhaiya would (also) continue the mission of uplifting humanity. Whatever Babaji's mission and plans, we must know that it is for nothing less than the best for devotees and evolution, for they never work anything for themselves. With this, anything that the Guru mentions or does should be taken as Guru Vaakyam Param Vakyam. It can never be that a guru would take any hasty or meaningless decision. Babaji said, "In every moment, keep the trust and know that your Baba is with you." However, Baba's excellent teachings and love continued pouring for all his sadhaks spread all over the world when he spoke, expressed, sang, danced and prayed for all. This shivir even though was for Sree Vidya higher level, but Baba spoke to all sadhaks in general. Will post soon the teachings and musings from Baba in the next post, that is coming very soon. June 13th to 17th - Shree Vidya Sadhana (Lucknow) 6:30 a.m. to 11 a.m.
Babaji also stated that advanced Shree Vidya sadhana level 3 would be conducted in the same place within a year. He also mentioned that after level 2 sadhaks continuing to crib about their illnesses and problems would not be eligible for level 3. He said that this is the highest level of sadhana that is being given to sadhaks for the benefit of humanity upon the instructions of the rishi mandala and so it must be taken with respect and seriousness. He said, "This deeksha was given in earlier times from a guru to disciple in the jungle or other natural habitats under extreme conditions after the student reached preparedness after spending years to be eligible to receive the deeksha and today it is given so easily and at such comforts due to the blessings of the rishi mandala." A huge roar of gratitude and salutations arose in the hall when he said, "In this world, there is only one living Guru giving deeksha for these levels of Shree Vidya Advait Sadhana and he is sitting in front of you." Gratitude to Babaji and Guruma... namah shivaya..
namah shivaya Jacob bhaiya ! i am a great fan of ur blogs :P. i am a student of age 19(ofcourse this is irrelevant to a shivyogi :) i am just seeking to get admission into a gud btech college. i had prepared very hard for my examzz but my results didn't go the way i would have liked to . i was deeply sad abt this . and only my dad follows shivyog(mummy thoda thoda believe karti hai but not my 3 elder sisters...but they are very supportive). but i am a strong supporter of baba atleast at my home. so i believe wat baba is doing is doing only for my welfare so inspite of my bad results i have kept on believing him. also i request my bros. and sisters to please for me so that i get into a gud college (NIT ROURKELA to be particular). and to jacob bhaiya u just simply rock !!!! bhaiya keep posting ur blogs they do guide us a lot in our journey to infinity. namah shivaya satyajit... follow your heart and follow what you feel is right, irrespective of what other's think or do. Baba says all have their own soul agenda and function and live according to their own karmas and thus are born to fulfill that which they have chosen to experience and thus not to try to change anyone, but accept them as they are.. also, if you start following Babaji's teachings in your own life and do sadhana, people around you will change for good with your aura of that divine energies..
stay blessed.. Baba is always with you.. namah shivaya..
i just love reading ur blogs. definitely i would sincerely follow wat u have asked me to do. and i am sure u will be always for me if i needed u .
love u all namah shivaya!!!!!! namah shivaya Kamathji.. what you are mentioning about is the orientation for the recent level 3 shivir.. what is in the post is about the next deeksha, next year.. namah shivaya..
namah shivay JOCOB JI, I was unable to attend the shri vidya level 2 shivir...In near future as mentioned can i attend the shri vidya level 3.
my gratitude to Babaji for allowing me to express it here.. namah shivaya..
@ Katkoori - nope, eligibility in all programs of shivyog goes sequence wise, you will have to complete previous courses before being eligible for the next level. namah shivaya..
namah shivaya anuradhaji.. level 3 is happening in december this year in singapore and also one happening this year end in Delhi.. I am excited to get level 2 and 3 deekhsha from YOU BABA JI. I am sure babaji you know why I cud not attend Goa level 2 shivir.